We have a new guest reviewer tonight - take it away, Tim! Hey all, I'm Tim. Long time reader, first time writer. 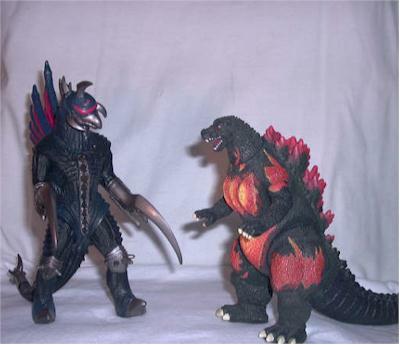 Today I'll be reviewing a Burning Godzilla (BG) I've had for a while and the newest addition to my collection, a "Final Wars" Gigan (FWG). 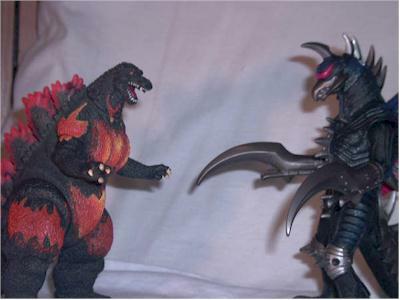 I've been a big fan of Big G for as long as I can remember, and I must say that these are the best figures of the two monsters I've seen. 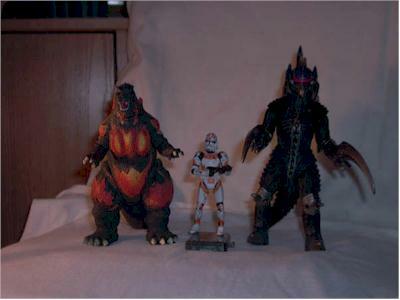 I bought godzilla from a friend, so he didn't have one. 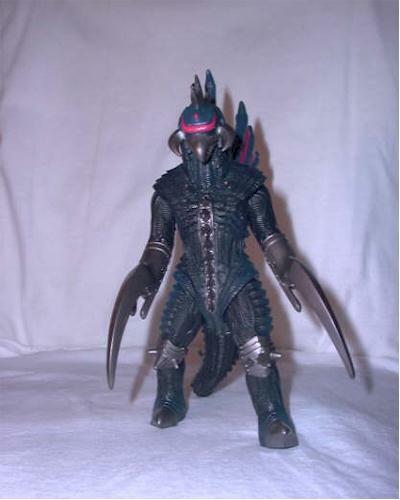 Gigan, on the other hand, was in a now-standard open-front box, held in with three zip-ties. A pair of nail clippers got him free pretty fast. 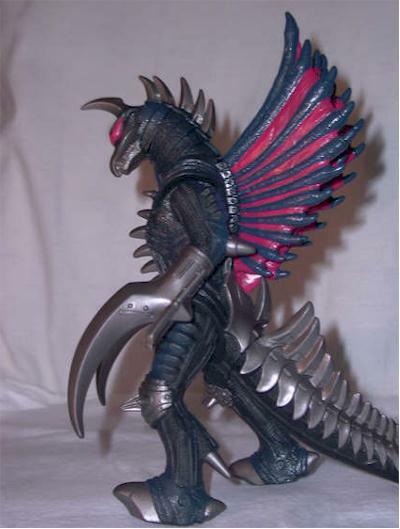 The back had images of FW Rodan, Gigan,, Godzilla and Angiuras. I'm planning on looking for the latter two, as Rodan didn't really do much for me. These are pretty dang good sculpts. They're a little soft, but it's to be expected from rotocast. 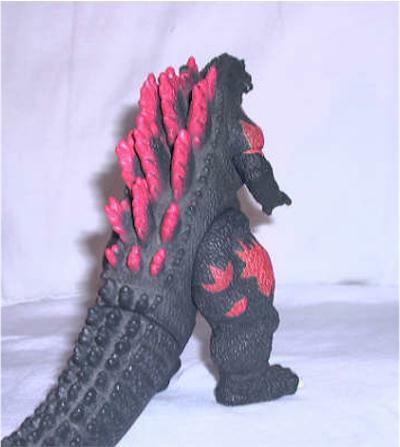 All of the individual scales and BG are there, right down to the tip of his tail. His spines are all unique, just like the real suit. The only problem that hit me was that the tip of one was broken. It doesn't detract from it all that much, so I don't think it's a problem. FWG is perfect. From the horn on the top of his head to the claw on his tail, he looks like a scale model from the set, well, at least to me. The smallest wire is detailed. The armor looks absolutely stunning. The plating on the tail, the spikes on the knees, the saw blade, even his teeth were perfect. BG is good in the paint, but he has a few flaws. 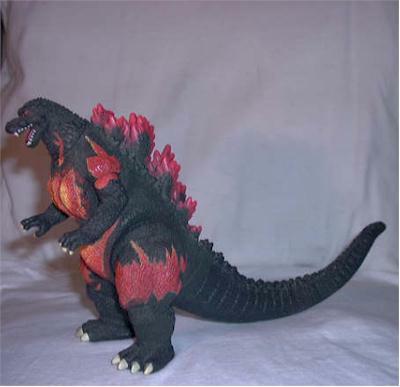 His tail is all black, and the red on his spines only go to the next-to-the-last row. His claws had a reddish tint to them, made me imagine him shredding another monster. 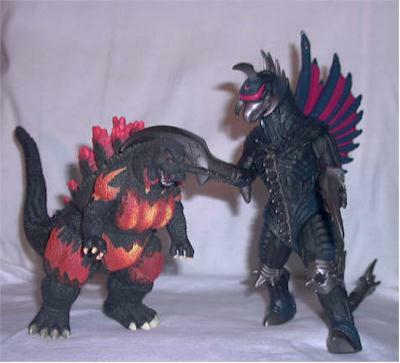 Again, Gigan gets high scores. The silver has little-to-no bleed onto the dark blue. The reed on the head is perfect, and the blue/red wings are great, except that the tips are painted blue on all three, but only the outside have the blue frame. It's still a great paintjob, so no big issue. C'mon, they're rotocast toys that look like guys in rubber suits, how articulated can they be? Surprisingly good, actually. 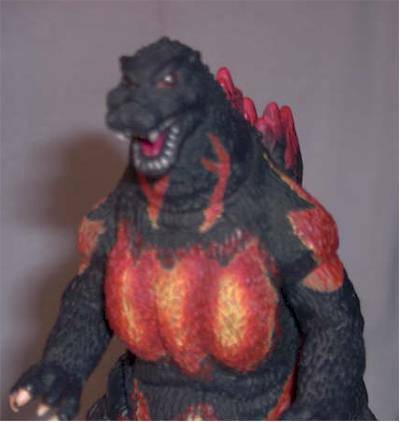 BG has the swivel arms that let him hug himself, cut hips that let him *barely* take a small step, and a cut neck that let's him look over at Minilla/Minya and tell him to clean his room. He also turns at the tail, but it's kind of a useless joint. FWG has cut shoulders, cut neck just past the second neck-plate, the same hips BG has, and it looks like there could be a tail joint, but at the same time it looks like it as glued together. Neither of these guys came with a thing, but you could always stand them next to a toy train set and remedy that. This is a blessing and a curse. 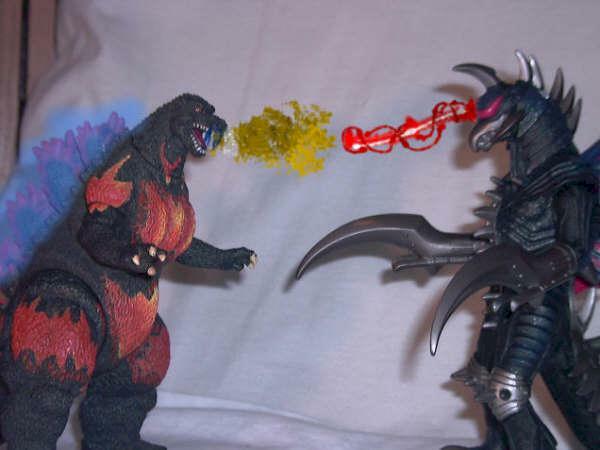 I hate toys with these things, but I would love for Gigan to have a light up eye and a moving sawblade. Any kid will love these to play with their dinosaurs. The would hold up to pretty rough play, and should be able to make great items for collectors, too. Like I said at the top, I bought the BG from my friend, and I only paid $2 for him. FWG on the other hand, was $7.99 at my local CVS pharmacy. He was the last on the shelf and I just had to get him. things to watch for: There could be a broken fin, like BG had. Other than that, you should be clear. These things have to be the coolest toys I've played with since I borrowed my other friend's MP-01 prime. Figure from the collection of Tim Thompson.